We're not saying that you can necessarily tell which country certain kitchens can be found in, but we thought it might be fun to see how various kitchen planners have sought to make a statement for their clients, throughout the world! 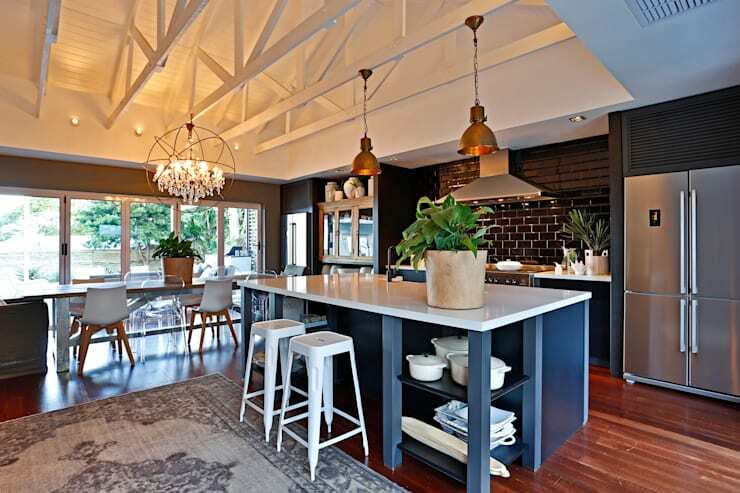 If you've been thinking that it might be time to give your kitchen an update, then we think you'll find all the inspiration, motifs and design nuances that you could ever need, right here, so let's take a tour of the world's kitchens to see which ones really speak to you! Oh Canada! Our home and native land! never mind our national price, it's time to have some serious pride in the kitchens that we have here!The mix of contemporary and retro aesthetics and materials here is so evocative of the melting pot that Canada is and we love it, not just because we have to! 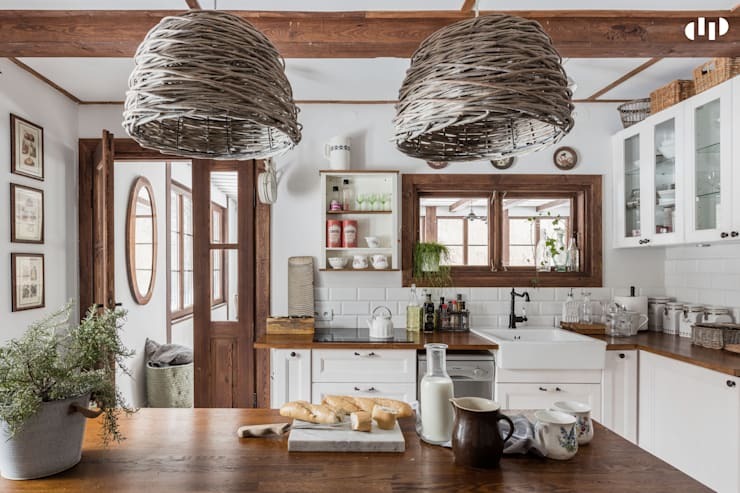 Well hello charming rustic country kitchen! 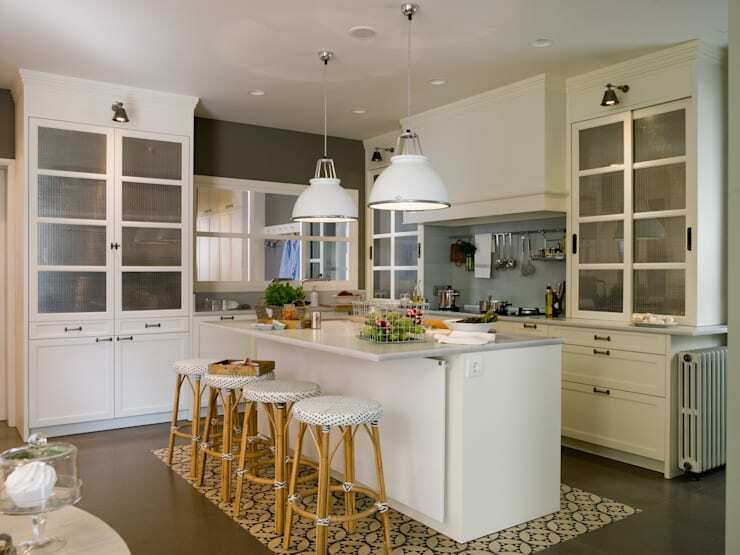 The mix of white Shaker cabinets and natural wood just looks fabulous and timeless and don;t you get a sense that this really is the heart of the home? Love that huge butler sink as well! What a luxury addition! 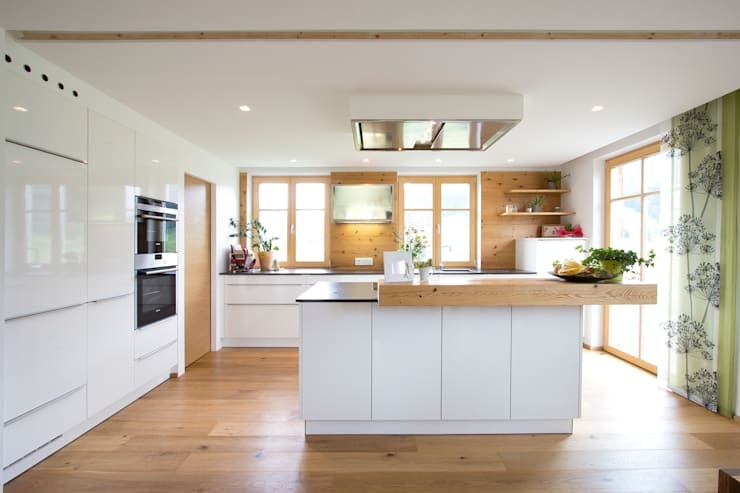 There's a cliche that Germany is known for efficiency and this kitchen certainly isn't doing anything to dispel that assumption, as it has such a practical, sleek and usable look. Nothing is there just for show and with so much storage, it is the ideal design for a busy household. We really like the natural wood wall panelling too! Wow! 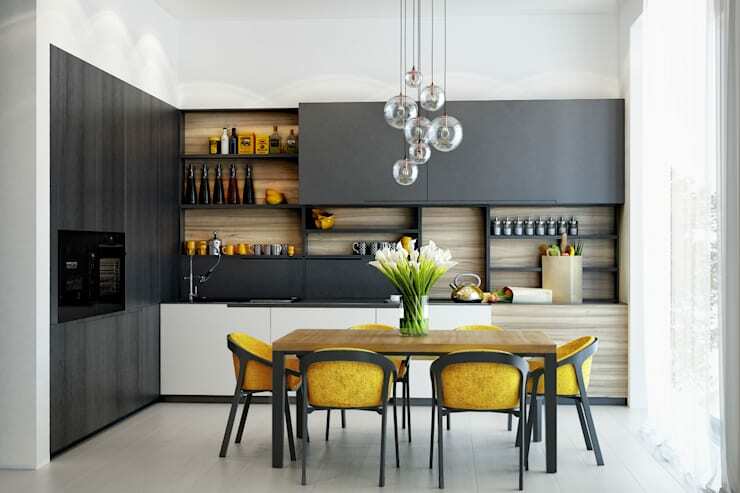 This kitchen has a really elegant and sophisticated feel to it, not to mention a little sense of fun as well! Without the yellow accents, this room would have been just a touch too serious, but the sunshine yellow additions have made everything really come together. The UK is really turning up the heat! Everything is centered around the island, which has a built-in extractor directly above it and offers an easy and sociable focal point in the room. 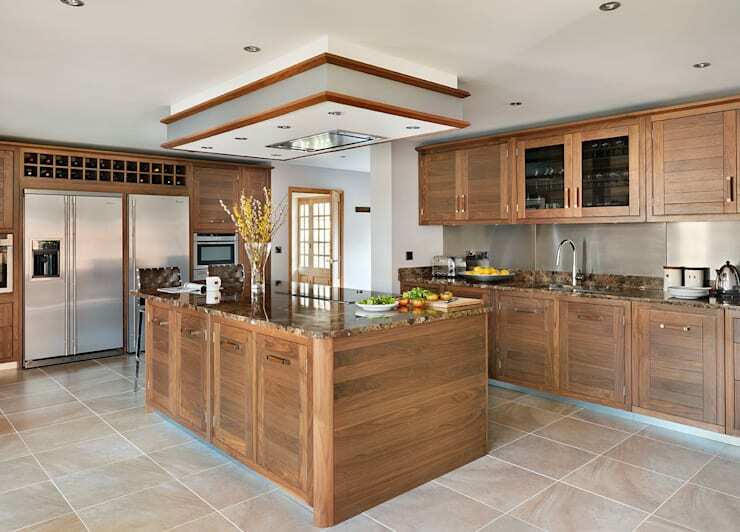 The use of luxurious dark wood has really added an extra level of decadence, as has the granite counter! We would have suggested that a Spanish kitchen might feature some pretty and pattern-heavy tiles, so we are SO glad to see we aren't wrong! A decadent section of floor tiles is the perfect accent for an otherwise neutral and understated space and we really like the amount of seating here, as it shows it would be good for a family. 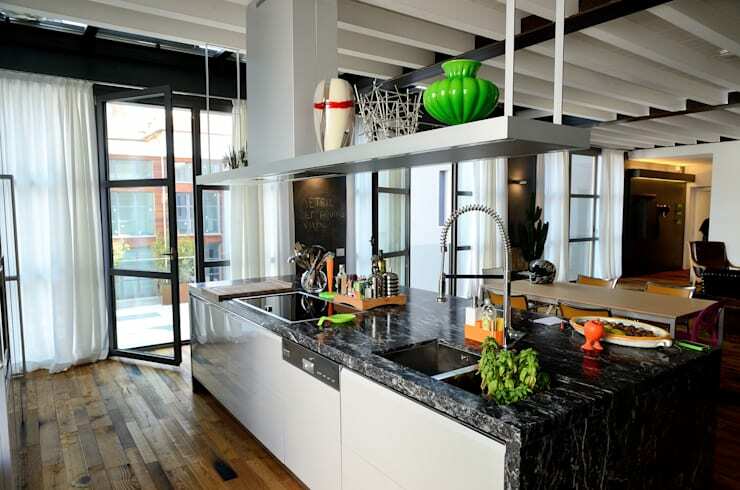 We all know that Italians LOVE to cook, which is why nothing short of a super fancy kitchen will do! A sleek marble worktop offers a huge amount of preparation area, which you need when you're making a ragu from scratch and the suspended shelving is so handy as well. What a pleasant kitchen! bright, fresh and so perfunctory, it's the practicality that adds a huge amount of charm. 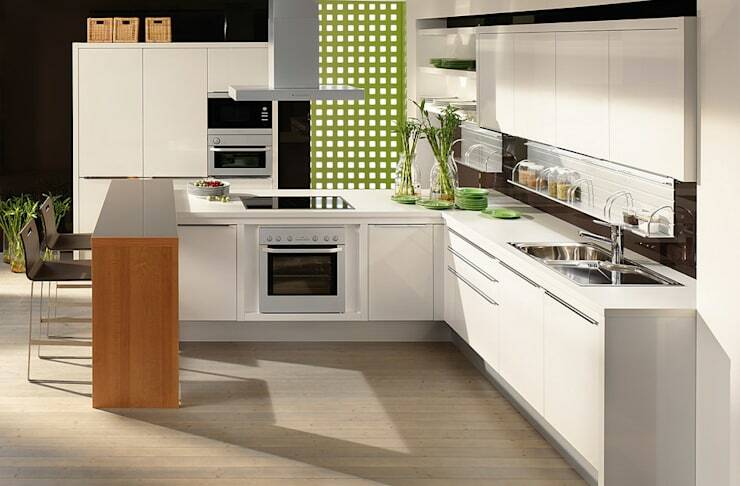 Choosing white for everything creates a clean and hygienic room and the integrated appliances make sure that the space has been used effectively. The vivid green accents sure don't hurt either! We are so enamoured with the notion of using the view as inspiration for a kitchen colour, which has clearly happened here! 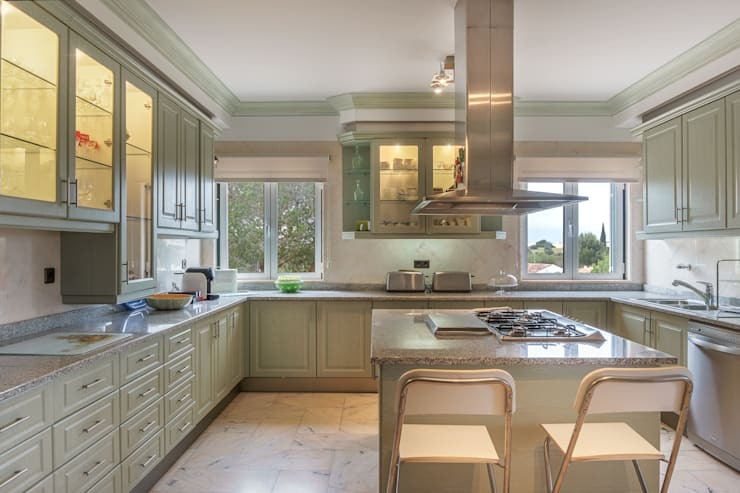 The soft green cabinets and trim looks incredible, and add in a little softness that the brushed metal appliances lack. What a gargantuan amount of storage too! 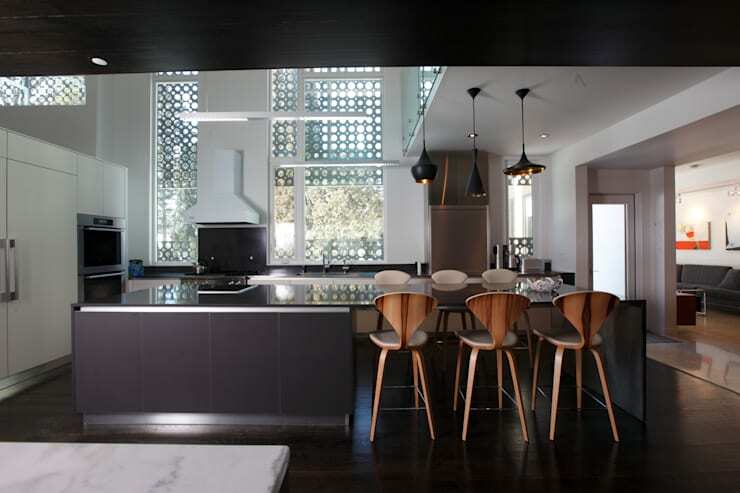 This beautiful kitchen has such a sense of fun running throughout it and we really admire that! Homey touches, such as an area rug and pendulum lighting work so well here and a navy and white colour scheme almost adds in a little nautical touch as well! What an eclectic space. 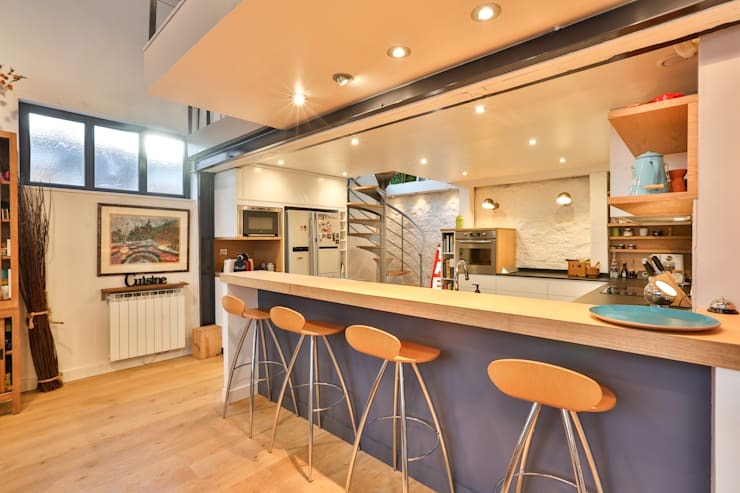 Finally, we say bonjour to France and enjoy a kitchen that is every inch as stylish and swish as we would expect from one of the fashion capitals of the world. Open, minimal and all about the lighting, this is a kitchen that looks as good as it functions and the long stretch of breakfast bar is utterly delightful. For even more great kitchen inspiration, take a look at this Ideabook: Kitchen wars: Canada vs USA! Which country tapped into your perfect kitchen aesthetic?